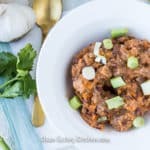 This easy Instant Pot Chili is the perfect meal prep dinner. It’s nourishing and hearty, and freezes and re-heats really well. Press the Sauté button on the Instant Pot and pour in the avocado oil. Let the oil heat up for a few minutes. Add the garlic and onion and let them cook for a couple of minutes so they start to soften. Add the ground beef and use a spatula or wooden spoon to break up the meat. Cook for 3 minutes. Add the broth, sweet potatoes, pinto beans, tomato paste, chili powder, ground cumin, and salt. Lock on the lid and set the time to 10 minutes on high pressure. When the cooking time is complete, let the pressure come down naturally for 10 minutes, and then release the remaining pressure. Remove the lid, stir, and serve hot. This chili will keep in the fridge for up to 4 days, or frozen for up to 2 months.